We're a few weeks into 2016 now, and if one of your goals is to improve your marketing for your B2B business, EZ Corporate Clothing has some tips for you. From improving your online brand to finding new customers, we've got you covered. 1. Check your online facade. You know presentation is important, but that goes beyond your storefront. What does your online profile look like. Sure you have a website to conduct your business, but what's it saying about you? Is it easy to use? Is it updated with the latest information? Is it mobile friendly? Many people will find your business online via their mobile devices (especially those who are busy running their own businesses!) and it's super important to make sure your website is usable in this format. People love to get behind the scenes of their favorite brands. So tell your story in your blog. How did you reach success? What were some of your setbacks along the way? How can you showcase the people behind your brand? Take some pictures of how your product is made and post them. We do this from time to time on our social platforms. We take pictures of orders as they are being made and post them, sometimes tagging the client to show their work in progress. SEO should be your friend. Blogging can help with SEO, as can Pinterest. Talk about topics relevant to your customers (one great idea is to answer common questions that customers can refer to as needed) on your blog and show off your products on Pinterest. Be sure to use your keywords as your blog tags and in the descriptions of your pins. Use social listening tools like Hootsuite, Google Alerts, and Topsy to track the conversation surrounding your products and your brand. Better yet? Keep an eye on your competition and stay ahead of the curve. 5. Create a budget for paid media. Set aside a budget (it doesn't have to be huge!) for things like AdWords, Facebook and Twitter ads, and even LiveIntent advertising. Social media ads can get you a pretty big bang for your buck, and with super specific targeting, you can get your ads right in front of your desired audience. You'd be surprised how far a $200 ad campaign on Facebook or Twitter can get you! The best social media site to be on as a B2B marketer is LinkedIn. People are looking to make connections with people in their fields, so get on there and find people who share your interests. You can also recycle your blog posts and post them on LinkedIn to expand their resonance. Whether it's with an influencer in your industry or a customer, engaging online shows your business is a step ahead. Always respond to customer interaction--whether it's positive or negative--in a timely manner. Helpfulness online goes a long way! What can you do to make your customers' experiences more personal? We've added a "Your Company Store" section to our website where frequent customers can repurchase their uniforms. This makes it easier for them to order and saves them some time in the long run. Find a way you can add a personal element for your customers. I guarantee you, they will appreciate it. A college friend of mine recently said that her company is terrified of doing anything out of the ordinary. How are you going to find new customers if you don't step out of your comfort zone a little? Go ahead and partner with another small business that complements yours on a promotion. Two is always better than one. As social creatures, humans like to listen to their peers. Whether that's on the next book they're going to purchase or what company their business is going to work with. You do great work at your small business--show it off! 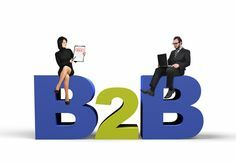 Let us know what some of your best B2B marketing tips are on Facebook and Twitter.